Poderiamos dicir que esta é unha receita de arroz cremoso de baixo custo, pero non no sabor, só no prezo. Para facelo, emperegaremos champis de lata e gambas conxeladas, iso sí, o arroz, que sexa arbório, para que nos quede ben cremosiño. Imos aló! 1. Desconxelamos as gambiñas e sofritímolas cos allos cortados en láminas. 2. Cando xa casi estean a punto, engadimos os champis e fritimos un pouco máis. 3. Engadimos o arroz, o mesturámolo ben coas gambas e os champiños para que colla sabor. 4. Engadimos 200 ml de auga (a metade do volumen total aproximado) e deixamos que o arroz se vaia cocendo sen parar de remexelo. (Removerémolo todo o tempo para que o arroz vaia soltando o almidón e faga que o arroz quede ben cremoso). 5. Segundo nos faga falla e ata que o arroz estea a punto, iremos engandindo máis auga (quentándoa previamente para non romper o fervor). Podemos ir engadindo a pastilla de caldo concentrado xunto coa auga. 6. Cando o arroz estea listo, só nos falta botalo no prato e botarlle un pouquiño de pirixel picado por riba. E a comer! Se usades gambas frescas, podedes cocer as cabezas para facer un caldiño que despois usaredes no arroz. 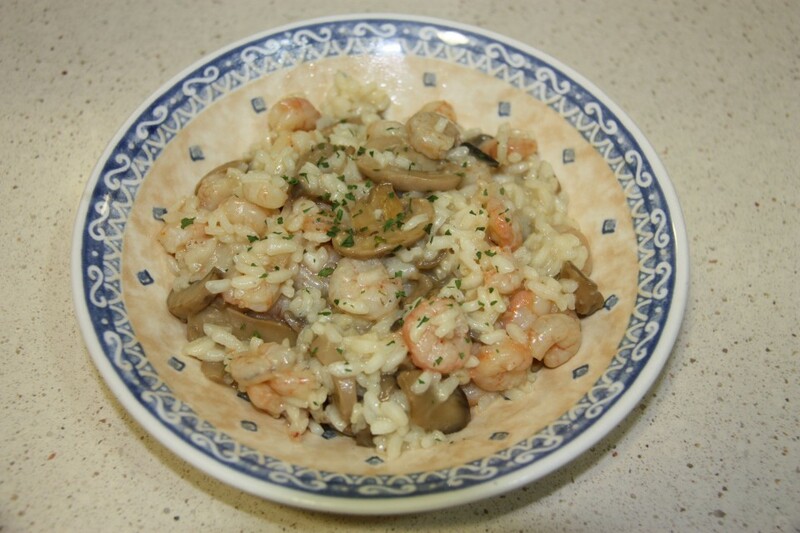 We could consider this risotto a low cost recipe (with a high flavour!!! ), because we will be using frozen shrimps and canned mushrooms. About the rice, this should be arborio rice to get a really creamy risotto! Let’s go! 1. Defrost the shrimps and fry them with the chopped garlics. 2. When the shrimps are almost ready, add the mushrooms and fry them a bit more. 3. Add the rice and mix it well for the rice to get the flavour of the shrimps and the mushrooms. 4. Add half of the water – 200 ml – and let it boil. The important thing here is to never stop stirring because thus, the rice will let the starch out and this is what makes the risotto creamy and soft. 5. Add more water (boiled water), as long as you need it and until the rice is done. You can add the stock cube together with the water. 6. When the rice is ready, just put in on a plate and put some parsley on. Time to eat! Enjoy it! If you use fresh shrimps, boil the heads to make a stock that will give a special flavour to the rice.